About he home: 1625 was the first home built on Gilpin Street in Country Club over a century ago. Designed by Arthur Fisher of famed Fisher and Fisher Architects, this beautiful 1909 Tudor has been owned solely by the Cowperthwaite family since its original construction. The past century has seen an address change from its original 305 Gilpin Street, a sunroom and servant quarters’ addition and a handful of tasteful renovations. It remains in near-vintage condition and wonderfully, none of the remodels has significantly altered its character. Except when they’re biting, stinging or otherwise annoying us, we spend most of our lives ignoring insects. But a closer look at our little exoskeletal fellow travelers can reveal not just utility, but beauty and deeper meaning. That’s the concept behind The Sacred Bug and the Insect, a group show at Hinterland Art Space featuring the work of Heidi Jung, Malea Ellison, Grant Williams, Gail Boyd, Norman Broomhall, David Zimmer, Robin Schaefer and Sabin Aell in mediums ranging from painting to installation and video. Aell conceived of the show when she realized that she and several colleagues were all working on pieces that explored the world of insects as it intersects with technology, nature, mysticism and dreams. The show opens tonight with a reception from 6 to 10 p.m. at Hinterland, 3254 Walnut Street, and runs through October 7. 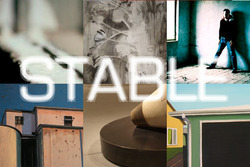 For more info, call 720-309-1764 or visit www.hinterlandartspace.com. Sellars Project Space is an elegant little gallery in the west side’s Berkeley neighborhood that was founded by artist and arts promoter Jimmy Sellars. His latest offering, Heidi Jung, is a self-titled solo dedicated to a Colorado artist whose work has been all over town lately, with examples at Ironton and the Center for Visual Art in addition to this show. Jung combines the influence of abstract-expressionism with an interest in botany in works done in ink and charcoal on vellum that’s been mounted on panels so they look like paintings. The show gets under way with an opening reception tonight from 6 to 9 p. m. at Sellars Project Space, 4383 Tennyson Street, 1D, and continues through August. Call 720-475-1182. Bugs and insects were always associated with the symbols of life, the big creator and shared great respect in a lot of cultures. According to one Egyptian myth, honey bees were the tears of the sun god Ra. It was the fly in egyptian mythology which gave protection agains disease or misfortune. The ancient egyptians also believed that the scarab beetle came into being itself from a ball of dung (the idea of self-creation). It was worshipped under the name of Khepri, which means 'he who has come into being' or 'he who came forth from the earth'. The god Khepri was associated with the creator-god Atum and was regarded as a form of the sun-god Ra. Just as the beetle pushed its ball of dung over the ground, so Khepri in the form of a scarab beetle, it was thought, rolled the solar disc across the sky each day. MERGE was juried by Greg Watts, current Chair of the Metro State Department of Art and Barbara Houghton, Professor of Art at Northern Kentucky University and former Chair of the Metro State Department of Art. As the CVA celebrates its 20th Anniversary it is significant that these two jurors have joined forces. Barbara Houghton played a considerable role in the creation of the CVA 20 years ago and Greg Watts has helped develop the CVA into its role today as contributor to the Rocky Mountain art scene and most recently, as an important anchor for the Santa Fe arts district. Highlighting some of the best talent to come out of the Metro State Art Department, MERGE features both emerging and well established artists, juried from a local and national basis. Eligibility to participate in MERGE was open to artists who graduated from Metro State in 2009 or earlier. All work was completed within the last three years. Profiles of the artists will be posted to the CVA Facebook page every week for the duration of the exhibition. Ironton celebrates 11 years in Denver with our annual 4th of July weekend party. We have a lot to celebrate this year with the addition of two new artists to the group; Chase DeForest and Yoshitomo Saito. Chase is an accomplished furniture and object-maker and Yoshi is a master bronze artist whose casting facility is now in the yard at Ironton. Ironton is open and serving art and wine for the 'RiENNIAL' our spring all-RiNo studio tour! 39 locations in RiNo are open for the Riennial. Win a case of Balistreri Wine or a gift certificate towards $1000 to spend with your favorite participating RiNo by getting a raffle ticket from each location. For each $100 spent on art you get TWO more raffle tickets. Click on image for extended view. Photograph by Sharon Meriash.Heidi Jung was chosen as one of the featured artists in the Children’s Hospital 2010 Designer Show Home event. One entire room in the show-house will be filled Heidi’s contemporary botanicals. Please join us to support The Children's Hospital by touring the show house at 100 Vine Street, one of Denver's most dignified landmark homes in Country Club Historic neighborhood. For more information on Heidi Jung visit her website athttp://www.heidijung.com. March 2010 Heidi spent a day with the Kindergarten and 1st graders at Foothills Academy in Lakewood, Colorado teaching them how to draw lobsters, crabs, and shrimp as part of their learning about the ocean this block. Foothills Academy is pleased to announce an exhibition of the art of Heidi Jung and Grant Williams, with an opening reception Friday, March 12, from 6-9 p.m.. Both local artists have been substantially involved in the growing Denver art scene for many years. Heidi is a Denver native whose works grace walls nationally and internationally. Kelsey Grammar and Prince Bandar of Saudi Arabia own some of her pieces. She exhibits locally at the Ironton Gallery, part of Denver’s growing River North Art District (RiNo). Incorporating ink, charcoal and photographic elements, Heidi’s paintings are full of detail and movement to interpret her love of plants and insects. Grant Williams earned a BFA from the University of Denver in printmaking in 1991. He has exhibited prints, drawings and sculptures at Plus Gallery, Open Press, The Arvada Center, Space Gallery, Chicago’s Workshop Print Gallery and The Amity Foundation. His most recent series of drawings, “Fall”, explores the laws of gravity. Heidi will also visit our campus Thursday, March 11 to do a workshop with some lower school students. We are excited for this opportunity and encourage you to come to the opening and bring your friends. Heidi is donating 25% of sales of her paintings to the school. Most floral artworks are like what they depict: voluptuous and highly colorful. But in a new group of 10 drawings on view through Feb. 20 at Ironton Gallery, 3636 Chestnut Place, Denver artist Heidi Jung has taken a less obvious and, in many ways, more interesting approach. Working in black and white, she creates what are essentially memento mori — ruminative, partially shrouded looks at flowers, which are often dried and past their prime. These ghostly apparitions stand in as metaphors for the passage of time and the fleeting essence of beauty. Some, like "Beyond the Fence," have a graceful beauty, while others are darker and, in the case of "Petit Roi," above, even a little menacing. Working on vellum, which is later mounted on wood panels, Jung combines white and black ink and charcoal in surprisingly inventive ways. Allowing serendipity to play a role, she lays down washes and builds up layers and then erases certain elements to leave shadowy traces. Someone must have told Heidi Jung that her plant drawings were 'pretty', 'delicate', 'sensitive', maybe even 'feminine', and she may have responded with "Not anymore." This new series, showing at Ironton, combines those previous botanical subjects, drawn with the aforementioned qualities, adding a strong, decisive willingness to experiment, and letting the media do what it will. The same plant subjects now become arenas of struggle, psychological crises, and battles of light and dark. ' Delicate' and 'sensitive' are still there but hovering over an abyss of darkness that we may recognize as our own subconscious fears. Jung's draftsmanship is extraordinary, the natural line of a plant's movement is just right. But much more, she is using massive areas of black, a color we do not often associate with living plants, to create a maelstom of surging emotions. We cannot separate the plants from ourselves and our emotional involvement. The blackest ink washes, under layers of encaustic, speak of intensities in nature, and our own psyches. It is as if the artist is saying, "You think you know my work? There's a lot more than you realize..."
Whoever thought a botanical subject could be 'explosive', 'convulsive' or 'heart-breaking'? 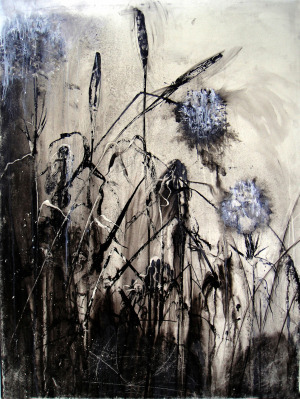 Heidi Jung will be exhibiting her new piece, Tulips, at the Dry Ice Factory's new gallery, Ice Cube Gallery. Juried by Art Critic and writer Michael Paglia, this exhibition focuses on artists working/creating in the River North Art District. For more information visithttp://www.icecubegallery.com. DENVER, CO December 5, 2009 - Ironton Studios and Gallery will be hosting an exhibition of new works by artist Heidi Jung. The exhibition opens to the public on Friday, January 15, 2010 with a reception for the artist from 6 - 10 p.m. This exhibition continues through February 20, 2010. Ironton Studios is located in the River North Art District (RiNo), just one mile north of downtown Denver at 3636 Chestnut. The Ironton gallery is open from 10 to 4 weekdays, noon to 4 on Saturdays, and by appointment. Sellars Project Space Santa Fe is pleased to host the opening reception for gallery artists Max Boschini, Sharon Bond Brown, Emmett Culligan, Michael Dowling, Sharon Feder, Maarten Haverkamp, Heidi Jung, Mauro Manuini, Tamara Riley, Kelly Schurger and Jimmy Sellars. Opening reception from 6 - 9 p.m. on Friday, November 20 with artists Emmett Culligan, Michael Dowling, Marie EvB Gibbons, Heidi Jung and Jimmy Sellars in attendance. For more information or directions please call 505.467.8253 or visit http://www.sellarsprojectspace.com. This exhibition continues through December 31, 2009. Ms. Jung will be exhibiting in Vail, Colorado during the month of July. Her work will be displayed with artist Michael Dowling in a two-person exhibit. For more information contact Worth Interiors. Sense of Place is an exhibition of small works (4 x 4 inches) by artists Sharon Feder, Heidi Jung and Jimmy Sellars. The term sense of place can be defined in many different ways; geographically, a feeling or perception, or through human attachment and belonging. Each artist’s work in the exhibition touches on each (and in some cases all) of these definitions. Sense of Place opens in Sellars Project Space’s new location at 4383 Tennyson Street on Friday, June 5, 2009 with an exhibition for the artists from 6 - 9 p.m. during the Tennyson Street Cultural District’s First Friday Artwalk. For more information (visit the Sellars Project Space’s website at http://www.sellarsprojectspace.com.